Aikatsu! – 152 | Mezashite! 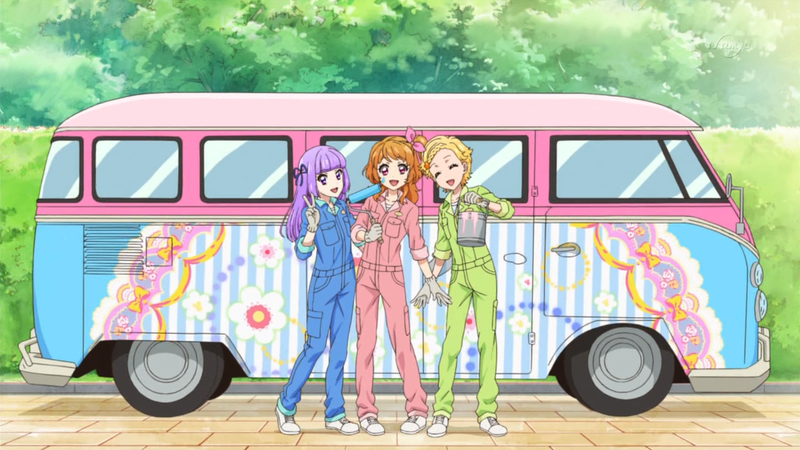 That’s it, the last episode of our third season of Aikatsu. It’s been three whole years, and I feel like we’re still sticking to our original philosophy of making subs with love. In fact, it’s so much love we seem to go through an average of one encoder a year. So there are apparently some easter eggs in this episode’s performance, the times it happens should stick out pretty clearly. We also chose the best name we could for the vehicle you see above. Say your farewells, because next episode is potatoes. Finally, an AIKATSU☆STARS! performance in this episode! During the Unit Cup, they gave us Skips, Dancing Diva, and Passion Jalapeno. Then in the Starlight Festival, they brought us Luminas and Vanilla Chili Pepper. Now, all six members are joined together under one name: AIKATSU☆STARS! Thanks for another great season; I’ll be looking forward to potatoes! I am a little surprised that the show’s not taking a week off, no rest for the staff I guess, and I’ll miss the aphorisms a little. Watched the season 4 opener raw, wow, talk about fresh, I think this is as big as when Akari-tachi became the main characters. I love it!